“GMA” weather anchor Sam Champion and boyfriend Rubem Robierb are engaged to be married. “We are thrilled and so excited and thank everyone for their good wishes,” says Champion. Champion and Robierb met through mutual friends a few years ago in Miami, where Robierb lives. Born in Brazil, Robierb is a fine-arts photographer who shows his work in Miami, Atlanta, Santa Monica and New York. After the announcement, congratulations and well wishes began to come in via Twitter. 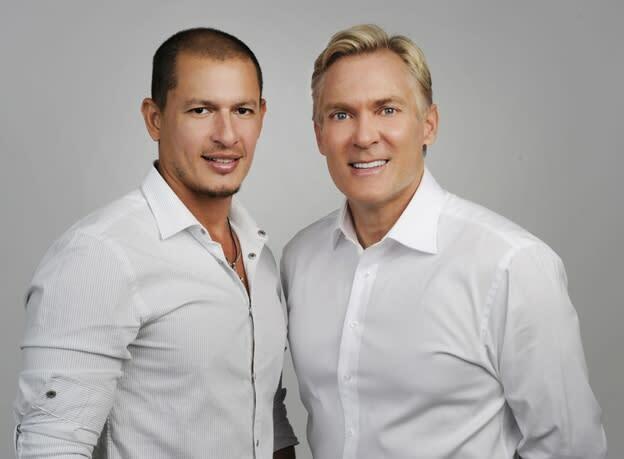 ABC News' President Ben Sherwood (@SherwoodBen) tweeted Congratulations @SamChampion & Rubem Robeirb -- thrilled for both of you -- wishing the very best. George Stephanopoulos (‏@GStephanopoulos): So happy for you @SamChampion – A big family hug from me, @AliEWentworth and the girls! Dan Abrams (‏@danabrams): Congrats to @samchampion on his upcoming wedding! Nice to see great things happen to great people. @SamChampion love you sammy.. mazel tov! ABC News 7 anchor Liz Cho (@LizCho7): Mazel Tov! So thrilled for you and Rubem. Bianna Golodryga (@biannagolodryga): Congratulations Sam!! John Berman (@johnsberman ): Mazel Tov!! All the best 2 u both! Tune in to "GMA" Monday to hear from Sam about his happy announcement.